Fatalities while crossing the road could become a thing of the past – the first ever Smart Crossing prototype has been unveiled and trialled in Mitcham, South of the capital on 9th of October. It alerts drivers when pedestrians are crossing the road, while at the same time allowing pedestrians know when it is safe to walk. The current 50 to 60 year old painted-on crossings just do not seem to cut it anymore. This world-first Smart Crossing prototype comes as a response to the figures released by Road Safety Analysis and the Transport Research Laboratory that suggest an average of 20 potentially dangerous incidents occur each day at UK crossings. The invention was developed and produced by hi-tech architectural firm Umbrellium. The 22 metre-long smart road surface can predict pedestrians’ movements, once triggered it marks out Zebra crossing lines and lights up the road surface with LED lights. The crossing is able to automatically turn its road markings to an appropriate colour, indicating when it is okay for a pedestrian to walk. It differentiates between people, cyclists and vehicles and changes road markings accordingly. It does so by using computer vision and does not need any manual involvement to be triggered. Smart Crossing is an intelligent system that is capable of adapting to modern pedestrians’ habits, such as the most dangerous and prominent one that is the careless use of smartphones. By using bright colours, the crossing is able to grab their attention and makes them focus on the road ahead instead. Bright colours are also used to light up the ground around pedestrians to identify them when is it predicted that they could be in a driver’s blind spot. Emergency setting is another feature that could certainly save a lot of peoples’ lives, a bright red road marking will go off when someone crosses the road suddenly, such as a child. 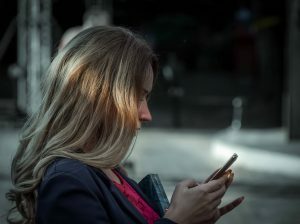 The modern society needs modern treatment, our cars are becoming more and more quiet and our eyes, which were meant to help us stay vigilant, are being increasingly pointed down, focused on our mobile phones. Because of such approach, safety measures need to change. Like any new invention, the Smart Crossing has also received some negative reviews, some people are convinced that introduction of these will only cause a simple road procedure to become a lot more complicated, while others are happy with the new technology, however believe that the production and introduction of these should be covered by the mobile phone manufacturers. No exact cost proposal has been discussed by the Umbrellium yet. Hence we can only assume that Smart Crossings are not exactly around the corner, but with this prototype attracting so much interest, it is most definitely nearing to reality.